EnviroPATH is a crushed stone blended with Envirobond’s Organic binder, designed for pathways and borders, offering DIY landscape materials. It’s designed to create stability in the aggregate you use for pathways and borders. The binder locks the aggregate together preventing washouts from rain, but remaining permeable to allow water through. Envirobond’s installation information is both thorough and informative, providing instructions as well as tips for homeowners and contractors. Envirobond’s organic binder has been blended with aggregate and installed in high profile projects all over the world and is now available for both landscape architects and as DIY landscape materials. The need for permeable and environmentally friendly materials, has seen the EnviroPATH material’s demand, increase at an exponential rate. The product allows you to use a natural material like crushed stone, without the negative element of instability. By staying in place, it provides a strong natural aesthetically pleasing material that still allows the water to pass through. The larger particles on the surface will chip off and create a loose upper surface layer that fits naturally into any surrounding. Because the profile of the material stays in place, it also acts as a strong weed deterrent when used as a border for gardens. 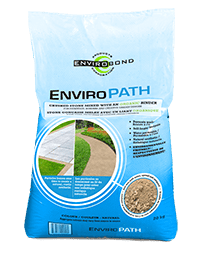 EnviroPATH’s organic binder is activated in contact with water, making it simple to use for DIY landscape materials. It creates a gel that grips the particles together. The locking of the particles, allows flowing water to travel over the surface without eroding. Each time the surface receives new moisture (i.e. rain), the glue swells in volume to create the gel, and allows excess water to pass through. EnviroPATH has been installed in high profile projects around the globe. From pathways on the Disney grounds of Shanghai China, to the walkway system at the Brooklyn Bridge park spanning the Brooklyn Bridge to the Manhatten bridge in Brooklyn NY, to the warning tracks for the San Diego Padres and Los Angeles Dodgers. Unlike concrete and asphalt, our products are made from 100% naturally occurring materials. Good for the environment and completely safe for plants, animals and people! These DIY landscape materials will add a new upgrade to your yard.